Tate Dyer and Renee Veit work on formulas in a Supplemental Instruction session for computer science. The free sessions are available for students in historically difficult classes to study with other students outside of the classroom. Tate Dyer’s first semester at Rochester Institute of Technology was a world of new responsibilities, friends, and finding out how to get the most out of his classes, especially those that were “historically difficult” with high percentages of failing grades and course withdrawals. Dyer, now a second-year computer science major from Houston, had heard about Supplemental Instruction (SI) for his first computer science course, where he could spend time with others from his class to go over course concepts and practice problems. SI sessions have been offered at RIT since 2007, and the program recently became the first in the state to be certified by the International Center for Supplemental Instruction, based at the University of Missouri in Kansas City, Mo. To become certified, RIT’s SI program had to demonstrate a strong focus on training and observing SI leaders and supporting them with planning for their weekly sessions. The courses supported by SI generally have high freshmen enrollment and D and F grades or course withdrawal rates of 15 percent or more. SI sessions differ from traditional tutoring because they are led by current students who have previously completed the class with a grade of B or higher. The leaders don’t give answers to the students. Instead, they encourage students to collaborate with their peers to work through problems and gain practice while reinforcing course content. Stephanie Haynes, SI coordinator in RIT’s Academic Support Center, said 28 percent of eligible students participated in at least one of the 1,337 hour-long SI sessions offered last year. Only 16 percent of students who participated in at least one SI session last year received a D, F, or withdrew from the class, versus nearly 22 percent of students who didn’t participate in the SI sessions. The following SI courses are offered this year: General and Analytical Chemistry I and II; Computer Science I and II; Principles of Microeconomics; Computer Problem Solving in the Information Domain I and II; Precalculus; Photographic Technology I and II; and Digital Fundamentals. SI support for a course in Computational Problem Solving I will be offered in the spring. The experience was so positive for Dyer, he became a SI leader this year for first-year students. Even though he successfully completed the course last year, he sits in the class again this semester to know what his SI students are learning now. He also participates in weekly training with other SI leaders. That’s exactly what he did in a recent session, where seven computer science students sat in and talked about variables and user-defined structures. “Awesome,” Dyer told a student who wrote a formula on the board. It was the first SI session Julian Vanderlinde, a first-year computer science major from Greece, N.Y., attended. “I’m here because a test is coming up and I need a higher grade,” he said. Renee Veit, a first-year computer science major from Wheatly Heights, N.Y., is a regular in the SI sessions. “I just like the extra reinforcement,” she said. 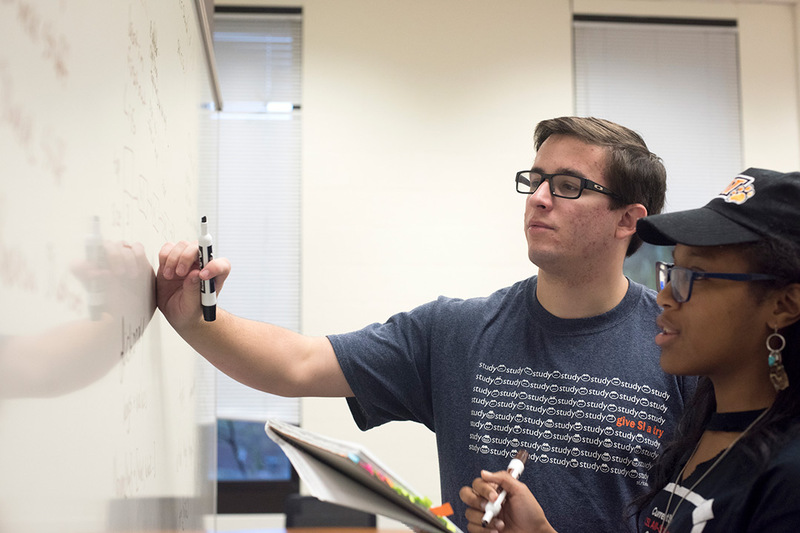 Jacob Brower, a first-year software engineering major from Carlton, N.Y., is another regular in the sessions, and figures his time is better spent studying than killing time. “I’d either be sitting on a bench outside waiting for my next class, or coming here,” he said. Emily Wesson, a fourth-year computer science major from Victor, N.Y., was Dyer’s SI leader last year. SI provides a welcoming atmosphere where students, in the supported courses, can ask questions and receive help from their peers and the SI leader. From this environment, a community forms among regular attendees and the SI leader. Wesson said SI was “super helpful” in her first year at RIT, and helped her land an A in the class. RIT’s cyber defense team took home third place at the 2019 National Collegiate Cyber Defense Competition, held April 23-25 in Orlando. The 12th annual Imagine RIT: Creativity and Innovation Festival kicks off at 6 tonight in Ingle Auditorium with Dr. Munson’s Performing Arts Competition. Then, tomorrow from 10 a.m. to 5 p.m., we pull back the curtain on creativity and innovation with some 400 interactive exhibits in science, technology, engineering, the arts and more, plus live entertainment.